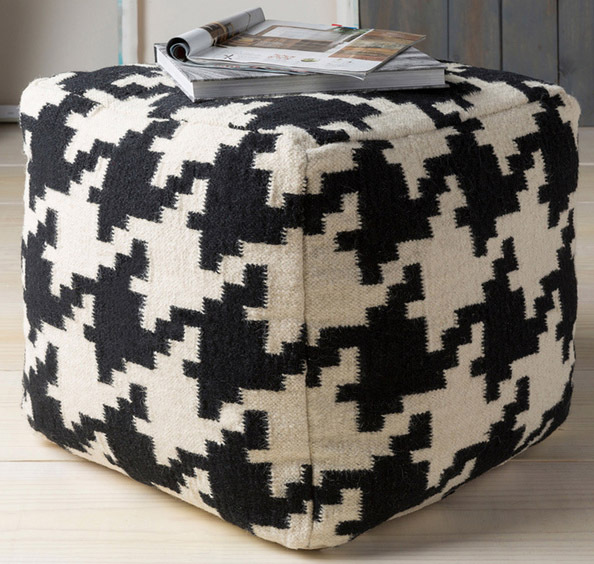 This handcrafted Black and White Tuscaloosa Houndstooth Square Pouf creates an effortless, clean look that translates from space to space as either a decorative accessory or as additional seating. $136.99. Free shipping. Buy here. 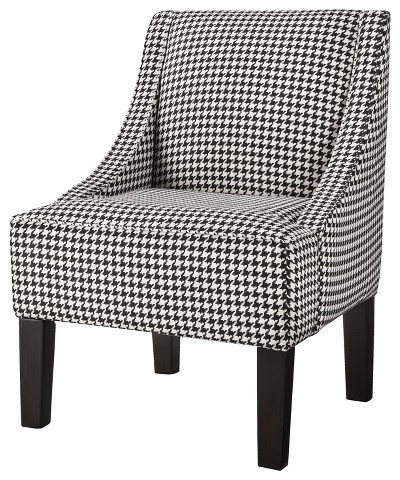 Clean, minimalist lines and a classic pattern make this Black and White Houndstooth Hudson Swoop Chair the perfect accent piece for your home. $199.99 Sale $99.98. Buy here. 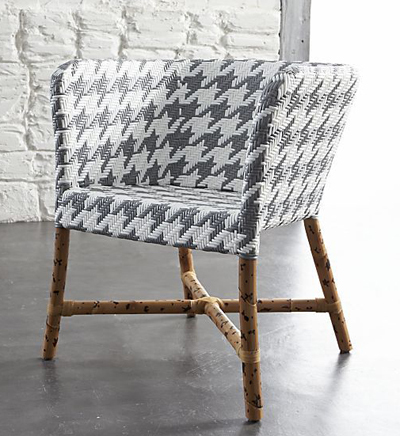 This Como Grey and White Woven Chair features synthetic rattan that wraps Paris café style around a natural rattan frame in a smart grey and white houndstooth weave pattern. $399 Clearance $349. Buy here. 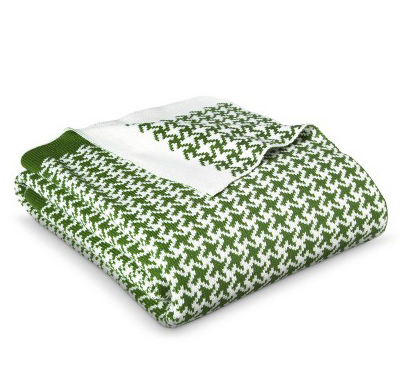 This cozy Green Houndstooth Knit Throw Blanket from Threshold is a great way to add color and pattern to a solid-color chair or sofa. $24.99. Buy here. 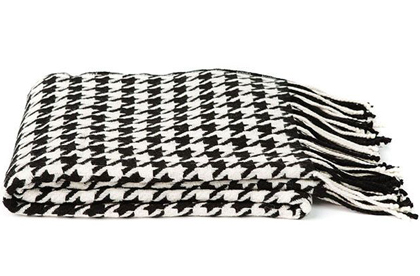 Our cashmere and wool Black and Ivory Cashmere Blend Houndstooth Throw brings the modern houndstooth pattern to your home. The finished edges prevents unraveling so you can enjoy this throw for years to come! $310 Sale $167.50. Free shipping. Buy here. 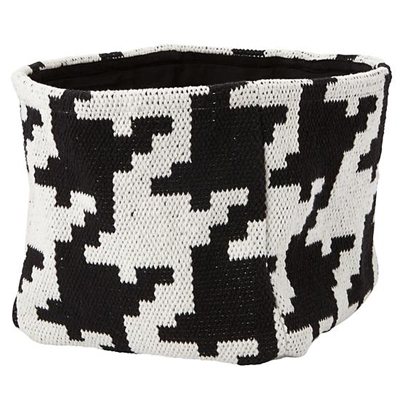 Adding one of these unique houndstooth Baskerville Floor Bins will instantly make your room neat and stylish. $32. Buy here. Oh-so-soft — like the feel of cashmere. No matter how you choose to use this versatile throw, you’ll revel in the amazing softness that surrounds you. 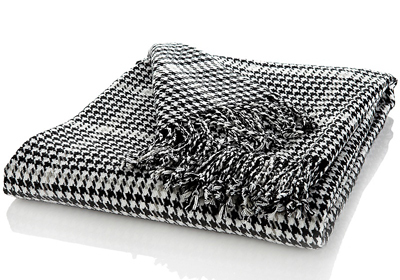 Light enough for everyday use, the Carleton Varney 50″ x 70″ Houndstooth Throw offers you a classic look with the coziness of today’s fabrics. $29.95. Free shipping. Buy here.